So happy to receive those lovely pictures from my niece in Paris! 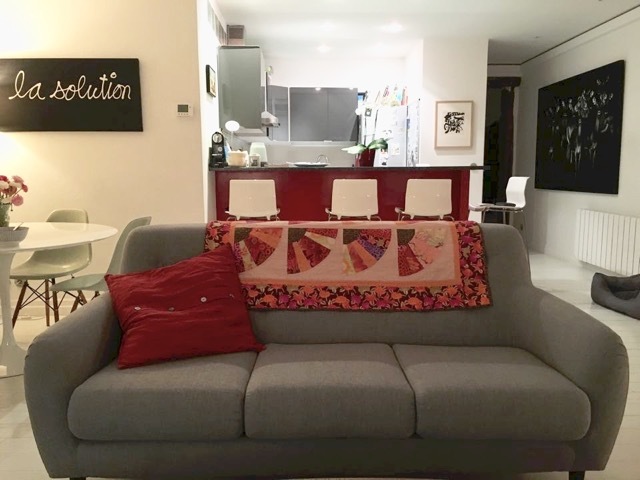 I had offered her this Fan quilt few years ago and she was pleased to show me how great it looks on her new sofa. How rewarding it is when you make a quilt for a beloved one and you see that it is cherished! 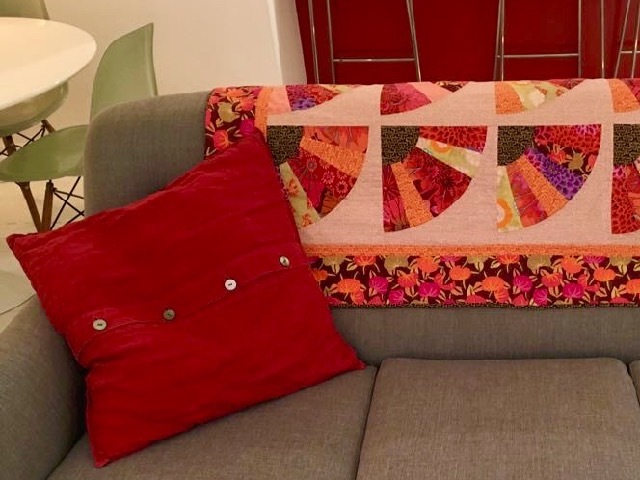 I had done this Fan quilt exclusively with Kaffe Fassett fabrics. It is square (about 1yard 25 x 1 yard 25) machine pieced and hand quilted. Looks like she decorated around the quilt! Quite a compliment! Il rend super bien sous le portrait de Marylin ! Dommage qu'elle n'ait pas fait un plan très rapproché du quilt ! Oups ! Je suis peut-être un peu trop tatillon ! Pretty quilt. It fits right in in your niece's beautiful home. It adds the perfect happy, comforting touch to her home. I'm sure she thinks of her loving aunt every time she sees it. Wonderful! 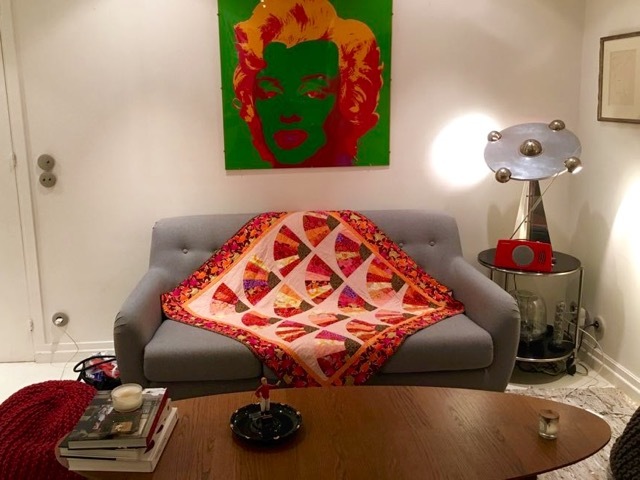 What a thrill to see your quilt looking so comfy in her apartment! 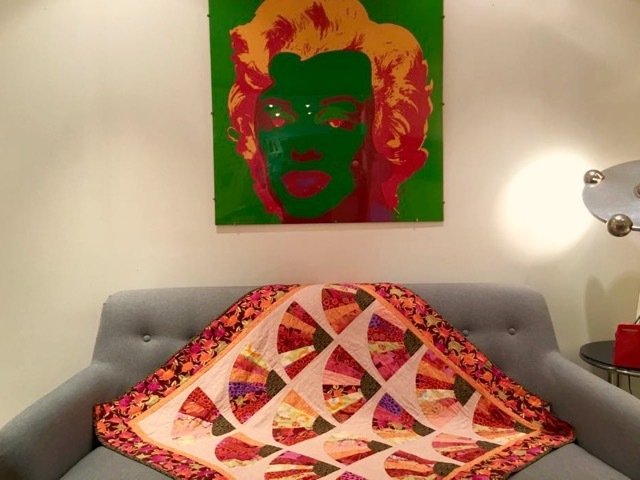 It sure is fun to see the quilts we made being used. It looks lovely in her apartment! Isn't that great. Looks lovely in her home. No wonder your niece is proud, Christine, the quilt is gorgeous and brightens up the whole room.